Had it not been for a good friend many years ago suggesting PR as a career option, Nitin Mantri may never have entered the profession that, he says, has given him so much. While finishing his MBA from the Birla Institute of Management Technology, Mantri was set to work at computer company Digital, set up by the now president of Nasscom, Som Mittal. Technology had always been an interest, but it wasn’t until chatting to a couple of friends that Mantri made his career-defining choice. "One of my now mentors was, I think, heading corporate communications in Xerox at that time. He said ‘you must try your hand at PR because I think you’ll be good at it’. So I said OK, I’ll give it a shot," he tells PRWeek Asia. "I interviewed at IPAN, which is now Hill+Knowlton, and Genesis. They both gave me a job and I chose Genesis. That was it really." So began a journey from Genesis, now Genesis Burson-Marsteller, to India’s dotcom world, on to London for a few years and then back to India to become CEO of Avian Media. Looking back at that initial decision now, after 20 years in the industry, Mantri says the creativity, energy and public affairs side of PR matched perfectly with his personality. "I was pretty active in my local community," he says. "With a couple of friends, I was running a small youth association and putting out a local magazine. "So I guess that drive and flair was there then, and I haven’t looked back since." 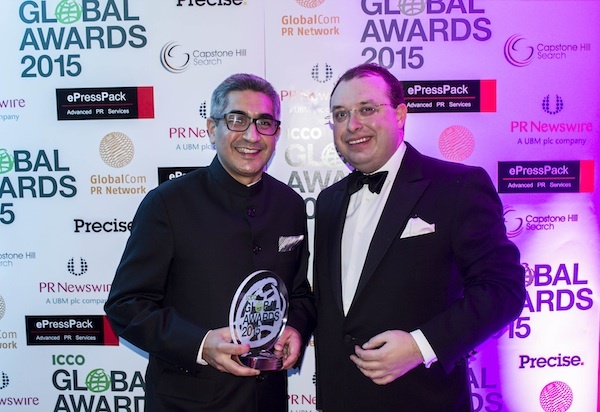 That attitude has taken Mantri to his present position at Avian, one of India’s leading independent PR agencies, and also saw him win Global PR Leader of the Year at the ICCO Global Awards 2015 (pictured), the first time the prize has been awarded to an Indian. "It was an honour just to be nominated, and of course I was thrilled to receive it," Mantri says, not wanting to dwell on the matter too long. "It’s been a good year." Having set up Avian in 2004 with just two people, Mantri and his business partner Nikhil Khanna, the firm now has more than 150 employees in six offices across India. Avian’s development over the past few years reflects the ethos of its two leaders, Mantri says: always innovating, evolving, trying new things to offer something different in the industry. To that end, the firm has broadened its scope and created a digital practice, content team and CSR division, as well as a separate government affairs unit called Chase. "Our vision is to be the most trusted advocacy firm within the next 10 years," Mantri explains. "We’ve managed to create a lot of content-driven integrated campaigns. That’s the change we’re driving today, and the results are showing in the types of clients we have been winning." Indeed, Mantri seems to have combined his passion for PR and technology. A glance at Avian’s portfolio shows work for the likes of Google, Dell, Philips and AMD, as well as large corporates from other sectors such as BP and Airbus. The desire to create an agile, digital-savvy agency was formulated by Mantri’s experiences working in London for several years at Omnicom-owned Brodeur Worldwide, now Ketchum. Having been exposed to a market where digital, content-based comms was at the core, Mantri was eager to bring that back to India, where things were not moving as swiftly. "When I came back to India, I didn’t think the industry had moved dramatically since I’d left," he explains. "But in the last four or five years, it’s become very different." Digital "had taken over" in Europe and the US, Mantri says, but it took India "at least another five years to start thinking about it". As such, his plans for Avian was to ensure it was ready to deal with clients’ digital demands when they came, and sure enough it is now a key tenet of PR services in India today. "Digital is now a much-integrated part of the play," Mantri says. "It’s happening pretty competently and clients are talking to us about it." It has been a similar evolution with content, he explains. Slow on the initial uptake, Mantri says Indian clients are now "seeing the scope much better" and providing engaging content across multiple channels. That said, there are still industries in India that are finding it harder to adjust than others, a feature of most countries. "The new-age startups, e-commerce clients, they understand the power of digital and creativity and they are the first ones to embrace it," Mantri explains. "Then there are the old, traditional companies – we do a lot of work in the defence space, for example – who find it difficult. It’s also because of the complex nature of their work." Coupled with the growth in modern comms services has been the desire for more Indian brands to venture outside the country, something that requires an open mind. Avian works regularly with clients in Nepal, Bangladesh and Sri Lanka, while Mantri says many Indian brands are looking to Africa for expansion opportunities. With the amount of work in India and around it, and the potential for that to grow, it’s no surprise to Mantri that the country’s PR scene is a competitive one, with all the major global networks having moved in and set up shop. "I think if you look at the top 15 agencies in India, there are now only three or four independents in that list," he suggests. "The rest are all global agencies." Moreover, Mantri feels there is more consolidation to come, but in a slightly different manner. Whereas the first phase was global agencies entering India, the next is to establish second brands within the country. "MSLGroup was the first to do it, when they bought Hanmer and then 20:20," he explains. "WPP has just introduced PPR into India. I think you’ll see that happen more with other agencies. "Or the same firms will start their own second brands in India because there’s a lot of business out here to be had. More people will also start buying up better digital capabilities." It’s clear that Mantri sees plenty of opportunities for keen-eyed PR firms to grow. However, he attaches one significant caveat to this that is an issue across Asia’s PR industry: talent. "Yes, India’s a growing market, if you have the right people," he states. "I think getting good talent remains a challenge in India. "The challenge is not that we don’t have people, it’s that we don’t have enough good, employable people." Harsh words, perhaps, but ones that are echoed throughout the industry. Again, though, in the spirit of thinking differently about a problem, Mantri says Avian is looking for talent outside the industry, and has had some decent results. "We have a lady who used to work for a stock-broking firm. She’s joined us and is doing wonderfully well," he says. "We also have somebody who used to teach, and somebody from a call centre background." Call centres are a huge business in India, and the market could be one of rich potential for PR, Mantri thinks. "After a couple of years in a call centre you want to get out – the timings don’t suit you, you don’t want to work overnight and screw up your whole day," he explains. "These people have the communications skills because that’s what they do all day, they speak good English, and all of them are probably graduates or postgraduates. The only challenge then is probably around content and writing, so if you can fix that, then it could work well." For his part, Mantri is trying to help enhance the talent pool by teaching one semester at the Xavier Institute of Communication in Mumbai, and one at the Institute of Mass Communication in New Delhi. He does this in addition to his duties at Avian, and as well as being appointed president of the Public Relations Consultants Association of India (PRCAI) last year. Mantri is keen to give back to the industry that he says has been so good to him, and particularly with the PRCAI, his mission is to take PR to parts of India where it is less well understood. "Right now if you look at where PR is, it’s in three or four metros," he says. "We’re taking it to cities where the perception of PR is very different. "These cities are becoming big digital players as well. If you talk to some of my clients who are in the e-commerce space, most of their sales are coming from cities where they don’t have access to big malls. They don’t have a big variety of stuff they can buy, so they’re going online." From his youth associating-running and magazine-publishing days, Mantri has always been keen on getting involved in issues and organisations that can help make important differences. That was largely the thinking behind perhaps Avian’s most successful expansion project: the establishing of government affairs firm Chase in 2010, a separate unit within Avian. Mantri says there was a gap in the market regarding public affairs work that he and Khanna were keen to fill, but it required going beyond being a PR agency. "Today we see a lot of clients in India – I don’t know how it is abroad – where you have a head of corporate communications and a head of government affairs and they never talk to each other," he explains. "So we wanted to pitch to the head of government affairs, and in the past we went as Avian Media and the perception was: ‘this is just a PR agency’. When we started going as Chase, we met the right people and that changed. It’s really worked for us." The firm is advising a host of clients on regulatory and policy work across India, and how to get their message across to the right bureaucrats. From educational issues for India’s Graduate Management Admission Council, to electronics industry standards work for Dell and a range of matters for Google, the public affairs space continues to grow, Mantri says. 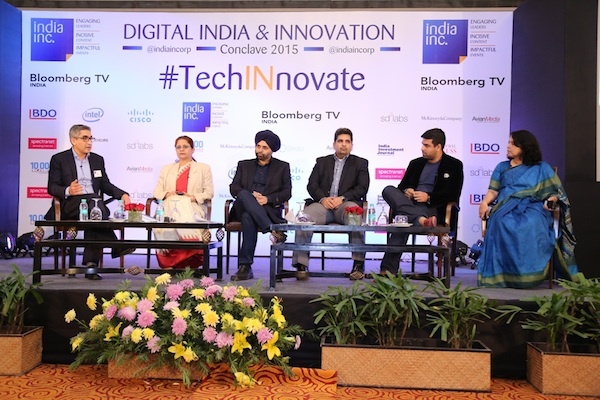 What’s more, Chase also holds its ‘Digital India conclave’ (pictured above), a conference that brings together top-level government officials and brands looking to do business in India. It is held in partnership with India Inc, a company run by Manoj Ladwa, who ran Narendra Modi’s prime ministerial campaign. Since its creation in December 2014, the conclave has gone from India to the US, Europe and back, timed around Modi’s state visits. Ministers, ambassadors and business leaders have all taken part along the way. Chase has even further to go as India’s public sector becomes more transparent, Mantri says. "It’s interesting times. I think the big change in this space is that clients now believe that if you run the right kind of campaign, they can see changes. We’ve seen changes," he says. "And you know, this whole urban legend about taking in suitcases of money… that’s all over. That scene is over." 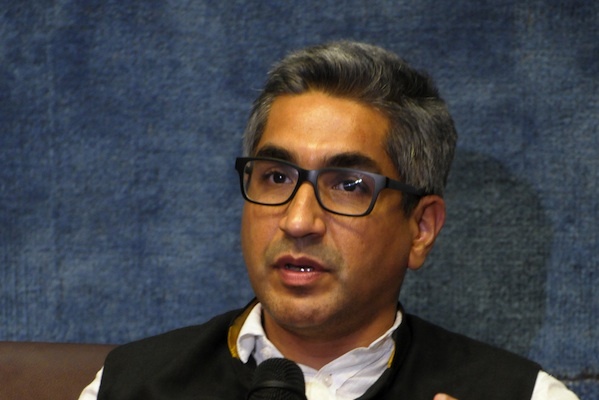 For effective public affairs strategies across a country as vast and diverse as India, Mantri says focusing on state-level comms is the key, as India’s central government devolves more power to the states. "We’re building expertise at the state level because we will see a lot of that work," he says. "For example, today we’re working with a beverage giant in six states." With so many roles to juggle, both with Avian and Chase, and externally with the PRCAI and teaching, it is clear Mantri is a man who loves to keep busy. As India’s PR market continues to grow and create more opportunities for ambitious firms, it seems there won’t be much cause for respite anytime soon.